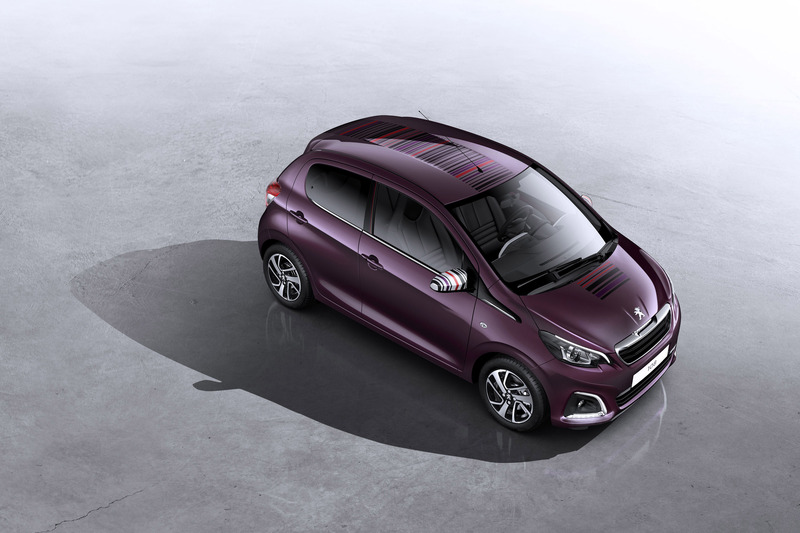 Another chapter in PEUGEOT's small car success story begins with the unveiling of the all-new 108. 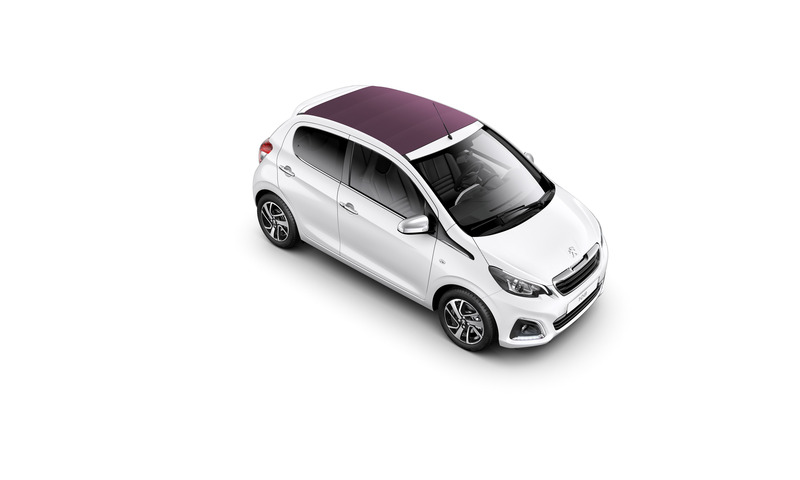 For the first time, the brand‘s urban runabout is available in two distinct body styles – the 108 Hatchback and the retractable fabric roof 108 TOP!. At 3.47m long and 1.62m wide, it's got the compact dimensions that will really make the difference in town. Its reduced overhangs and turning circle of just 9.6m allow it to avoid obstacles with ease. This architecture allows the driving position to be brought well forward, providing excellent vision in every direction. The car has been designed to excel in urban traffic. The front end is dominated by its bold grille, central beam and lower air intake, while the front lamps are firmly set into the bodywork. Common to all trim levels, their ‘technical' design combines smart black and chrome to give the car a sharp and dynamic look. The upper sections contain LEDs for daytime running lights. With its machine-finished edge, the grille surround creates a solid on-road presence and proudly houses the PEUGEOT name badge. The famous Lion logo sits above, central between the two bonnet lines which run up to the windscreen in one fluid movement. From the side, the 108's compact form is highlighted by its front and rear overhangs, both reduced to the minimum. Access to the interior remains easy, with one or two doors on each side that stretch almost from wheel to wheel. The car's dynamism is underlined by a chrome blade that emerges from the front wings and extends to the bottom of the glass above. The wraparound-style rear lights include all functionality and, with a 3D effect, make the brand's three-claw signature motif appear to emerge from the body. Together with the horizontal lines of the rear bumper, they give the car an extra perception of width. Above, the large glazed tailgate extends from the spoiler to the loading sill with integrated hinges. At the base, opaque markings mask the load space. The contemporary and sophisticated exterior is mirrored on the inside of the PEUGEOT 108, with a comfortable cabin that feels like it has come from a much larger premium car. It has been designed to be intuitive to use, with each area being allocated to a specific function and information brought together for easy and quick reading. The speedometer housing forms part of the steering column, which is adjustable for height, and covered by a cowl to ensure it is legible in all light conditions. It comprises an analogue speedometer and an LCD screen arranged concentrically. Either side, extensions house the rev counter and gear shift indicator. Once the driver is sitting in the height-adjustable seat, the various controls are all within easy reach. They include the striking 7-inch touch-screen, the starter button coupled with the PEUGEOT Open and Go system, plus the automatic air conditioning. Behind the steering wheel are controls for the speed limiter, while the fuel filler flap opening and heated electric mirror controls are easily accessible on the dashboard. The controls for the front electric windows fall readily to hand, grouped together on the driver's door panel. For customers opting for the retractable fabric roof 108 TOP!, the electric control switch for the fabric roof – 80cm wide and 76cm long – is just above the rear view mirror. It's possible to adjust the opening to any position, and an aero-acoustic deflector is deployed automatically to reduce cabin turbulence. "From the start of the project, we wanted to create a car that made the driver happy. 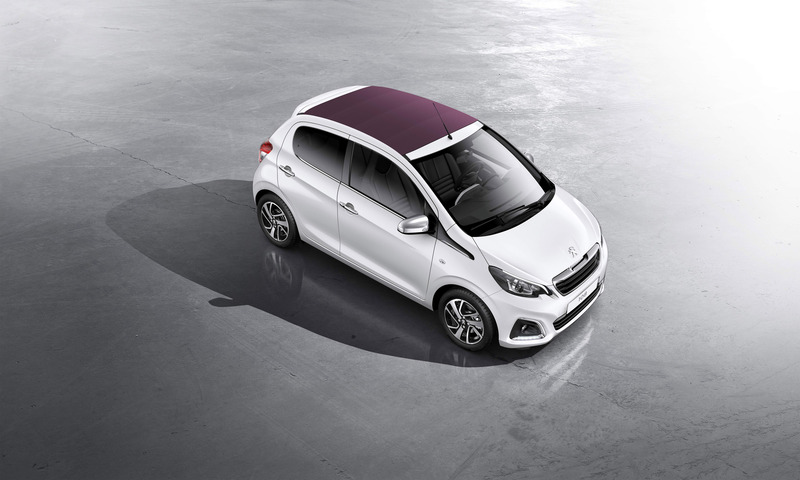 With its many qualities, the new PEUGEOT 108 makes you smile, every day. 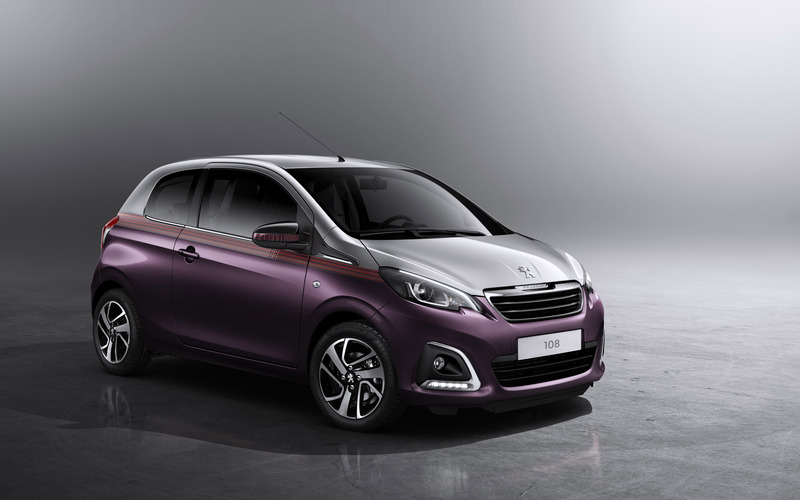 With personalisation, everyone will have their own unique PEUGEOT 108." Béatrice Garric, Brand Project Manager. 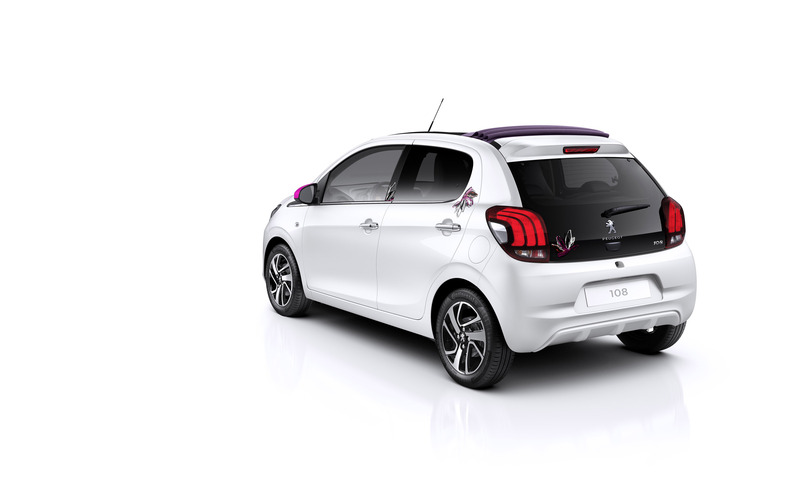 The all-new PEUGEOT 108 is already packed with character, but customers can add even more by choosing from a wide range of personalisation options. For body colour, there are eight striking shades, including two which are exclusive to the model: Aïkinite is a golden copper, and Purple Berry, a stunning shade of violet. Reserved for the three-door hatchback are two versions of two-tone paint, Purple Berry and Zircon Grey, or Diamond White and Aïkinite. Anyone opting for the 108 TOP! model has the choice of three retractable fabric roof colours – Black, Grey or Purple Berry. In addition, there are seven personalisation themes, three interior ambiences and a choice of six trims. The Peugeot 108 will cater for every taste. 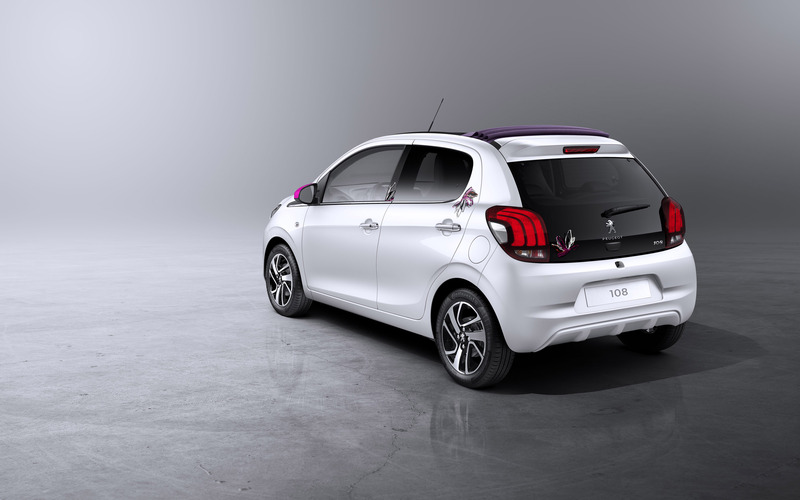 "PEUGEOT 108 is the city car that is ahead of its time. Evidently it is hyper-compact; that is the basic requirement. It takes its driver into a new era of connectivity with the Mirror Screen technology. At the wheel, the experience is unprecedented." Pascal Béziat, PEUGEOT 108 Project Director. The all-new PEUGEOT 108 brings the urban car into a new era with its large touch-screen in the middle of the dashboard. Standard from Active trim, this 7-inch display boosts the relationship between car and driver to a new high. It is the interface for the audio system, trip computer and for vehicle settings, but using Bluetooth® connectivity is also the access point for the driver's smartphone. The user can connect the phone's applications that are compatible with use in a vehicle using Mirror Screen. This function operates using MirrorLinkTM technology for telephones running on Android, RIM and Windows, and by AppInCar for telephones running on Apple's iOS. It means the touch-screen in the PEUGEOT 108 becomes a mirror image of the connected smartphone. The driver then operates their smartphone from the car's touch-screen. Depending on the telephone connected, applications can also be operated by voice commands using a voice recognition system. For obvious safety considerations, access to applications is managed differently according to the state of the vehicle. For example, when the car is moving, the driver can only use applications such as navigation, or those for infotainment. This includes PEUGEOT Music, the brand's internet radio station. "For the buyer, the new 108 is the guarantee of the brand's move up-market. Style, quality, equipment, engines …everything has been taken into account to satisfy the customer who has the feeling of driving in a vehicle from the segment above." Xavier Nicolas, PEUGEOT 108 Product Manager. 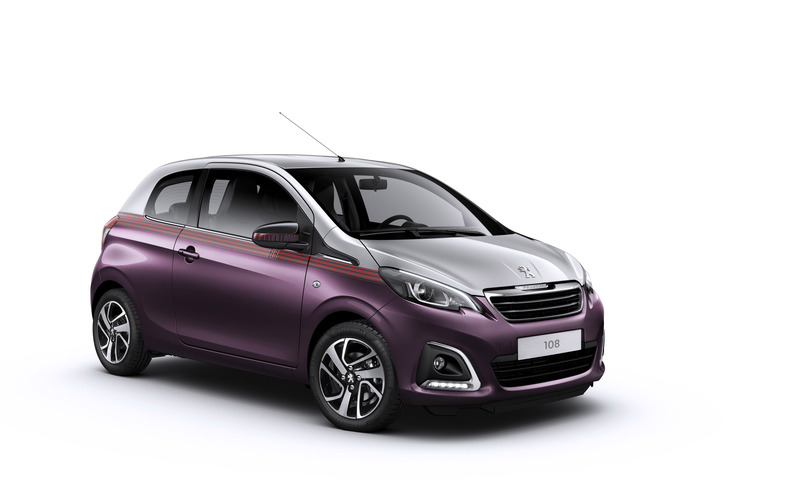 With its compact dimensions, the all-new PEUGEOT 108 is dynamic and agile around town, with excellent all-round visibility and practicality. 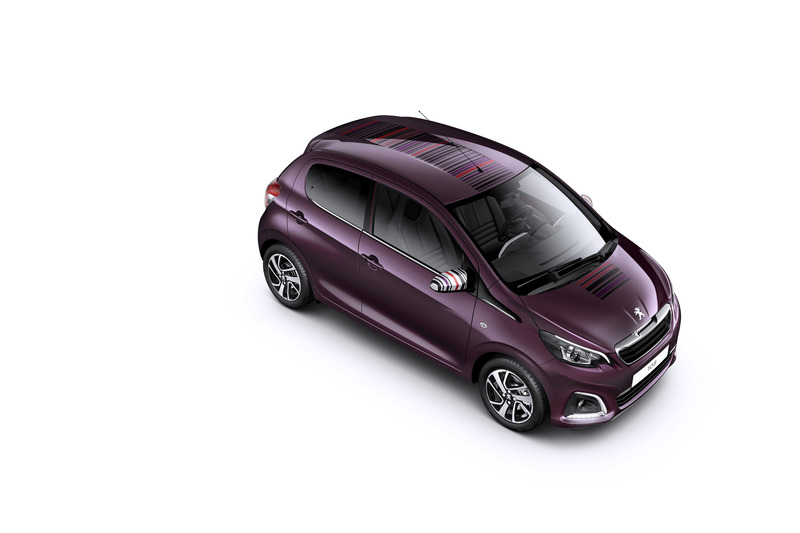 For example, the PEUGEOT Open and Go system allows the doors to be unlocked, and the tailgate to be unlocked and partially opened, with just a press on the appropriate button. On opening the tailgate, the parcel shelf automatically folds away against the rear screen and reveals a boot that is generous for the segment – 196 litres with the puncture repair kit, 180 litres with the spare wheel. Loading is easy thanks to the low sill, just 77cm off the ground, and a metre-wide space between the wheel arches. The initial volume can be extended to 750 litres by folding the 50/50 rear seat backrests forward. To do this, simply pull one of the straps accessible from the boot. Inside, the PEUGEOT 108 provides several storage areas. For example, the glove box and door pockets will take a 1-litre and 500ml bottle respectively. A comfortable driving position is quickly found using the steering column height and seat adjustments. The PEUGEOT Open and Go system means the driver can simply press the button on the centre panel to start the engine. The driver can concentrate on safe driving thanks to the speed limiter and automatic lighting. If reverse gear is engaged, the reversing camera displays a colour image on the touch-screen. Passengers are protected in all circumstances by six airbags fitted as standard: two frontal airbags (the passenger airbag can be switched off), two lateral airbags at the front, and two curtain airbags covering the front and rear seats. Finally, for the safety of children in the car, the two rear seats are equipped with IsoFix mounts. Each works to take advantage of the lightness of the PEUGEOT 108 – it weighs from just 840kg – to provide occupants with the perfect balance between road-holding and comfort. Running gear has been developed around a pseudo-McPherson front axle and a deformable rear beam made from a shaped tube. Compared to a component made from pressed steel, this solution offers the advantages of improved guidance and reduced weight. As soon as you take the controls of the all-new PEUGEOT 108, it reveals just how easy it is to use. Its light weight, electric power steering and the quality of its running gear all make their contribution. The track is 1,425mm at the front and 1,420mm at the rear. There are two tyre sizes, 165/65 R14 or 165/60 R15, with ultra-low rolling resistance. They are continuously monitored by the Indirect Tyre Under-Inflation Detection system. All models have Hill Start Assist. The braking system includes ABS, Electronic Brake Force Distribution, Emergency Collision Braking System and switchable ESP as standard. Stopping power comes from 247mm ventilated discs at the front and 200mm drums at the rear. All this advanced technology combines in the PEUGEOT 108 to make every driver smile. With responsive steering, stable braking and a refined ride, the car is just as at home on the open road as it is in town. It's a compact vehicle for a new generation of urban drivers who seek a sophisticated and versatile model that meets their every motoring need. 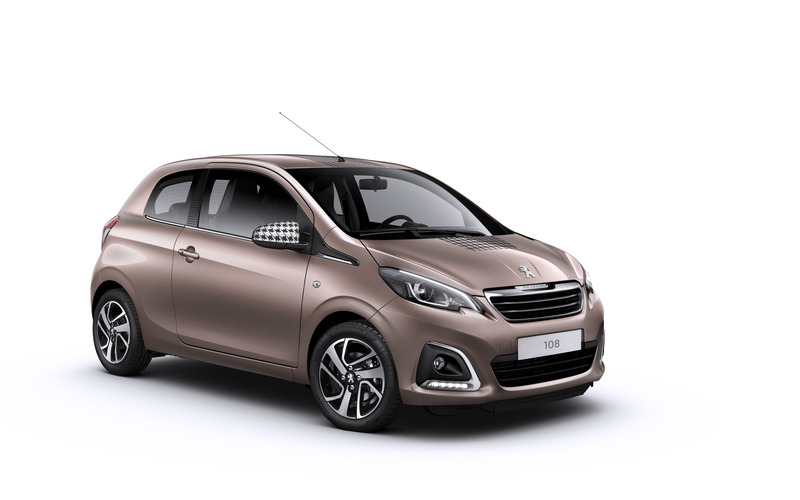 The PEUGEOT 108 means there is no need to compromise, with a high level of standard equipment, a wide range of desirable optional extras and great value for money. 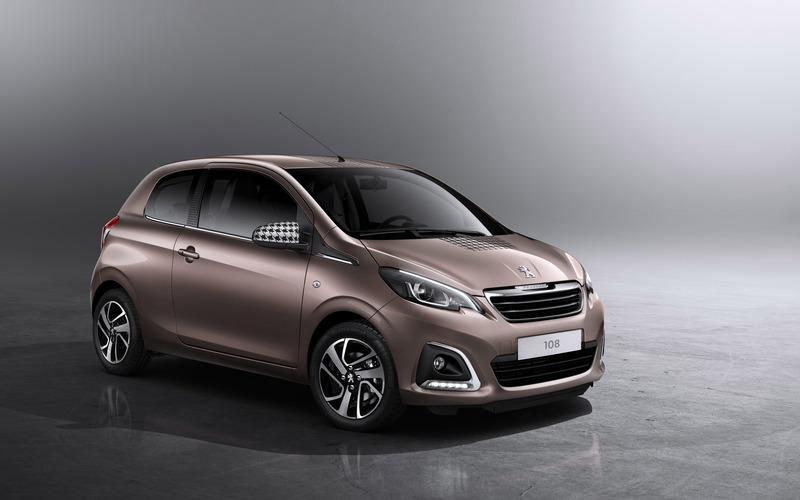 The all-new PEUGEOT 108 will have its world premiere at the Geneva Motor Show on Tuesday 4th March, and will go on sale in the UK on 1st July 2014.